Michael Woods (EF Education First) has shown why he is the main GC man for the team in the Giro d'Italia by finishing in second place in a tough uphill finale in stage 4. 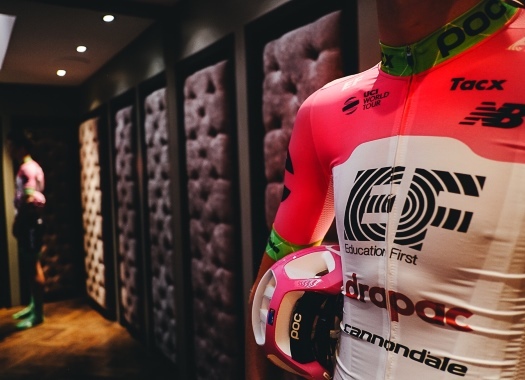 One of the objectives of EF Education First for the Italian grand tour was to get a good GC position for Michael Woods. The rider showed an outstanding performance at the fourth day of racing and finished just behind Tim Wellens. "Today Wellens was just the strongest guy," said the Canadian at the end of the stage. "I got split up at the bottom but managed to get back up and I felt great. "The guys were really good for me. Everybody was helping me, everybody in the team was amazing but Wellens was just the better man." The rider also finished second in this year's edition of Liege-Bastogne-Liege and despite his good performance of the day, he's still waiting for a victory. When asked about taking a win in one of the upcoming stages after today's work he only answered: "I wonder when."